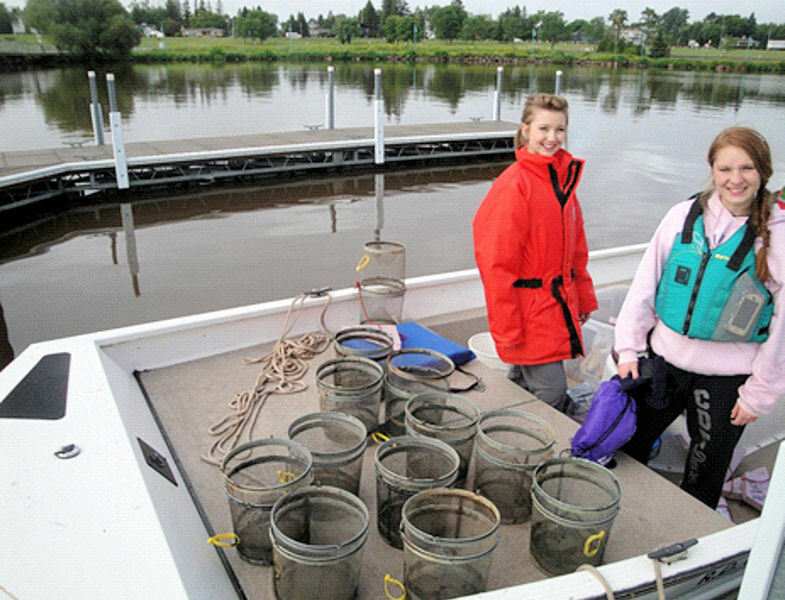 Cynthia Welsh and Madison Pallin sample water quality on the the St. Louis River Estuary and Lake Superior. Pallin, currently majoring in Environmental Science at the University of Minnesota, Duluth, hopes to become a marine biologist like her brother Logan Pallin, Welsh said. Photo courtesy of Welsh. Every year an impressive group of young scientists compete for the U.S. Stockholm Junior Water Prize (SJWP). Whether these high school competitors win or not, many go on to make remarkable achievements. Cindy Welsh, seventh grade science teacher in the Cloquet (Minn.) Public School system for the past 15 years and director of the Northeastern Minnesota Regional Science Fair for the past 10 years, has mentored many competitors and witnessed their hard work and achievements. Students who work either as individuals or in teams are invited to submit research papers to compete in their state’s SJWP competition each year. Water Environment Federation (WEF; Alexandria, Va.) Member Associations select winning projects for each state. State winners receive a trip to the national SJWP competition. The national winner receives %10,00 and a trip to Stockholm to represent the U.S. at the international SJWP competition. Cassandra Roy, former Stockholm Junior Water Prize (SJWP) participant, works on a project that she entered into both the SJWP competition and Intel (Santa Clara, Calif.) International Science and Engineering Fair. 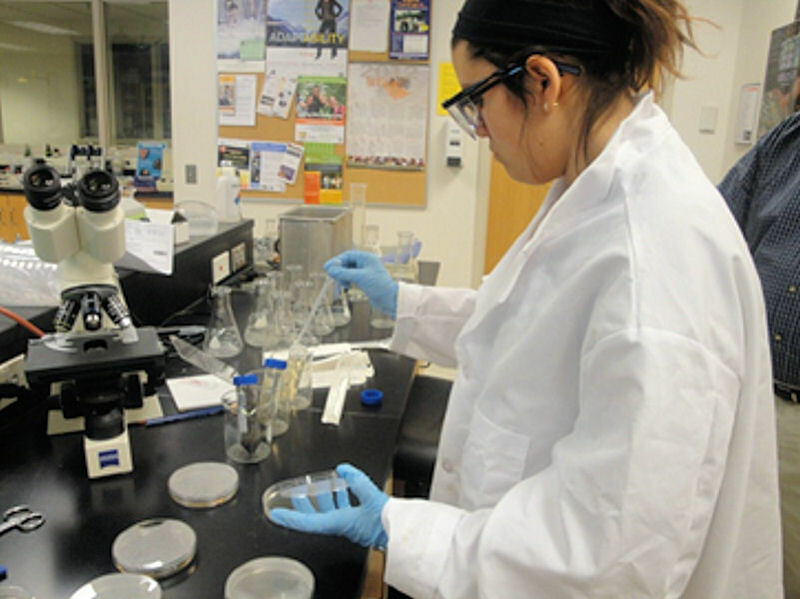 She studied the effect of sulfur mining on a strain of bacteria that lives on wild rice. Photo courtesy of Welsh. 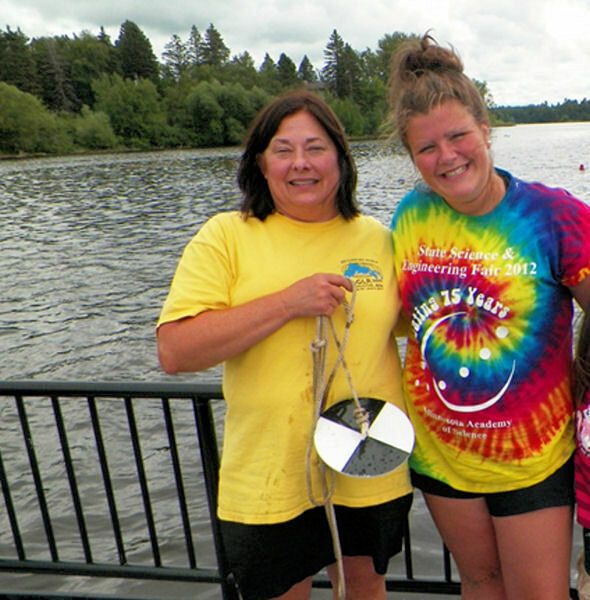 Christine Neumann and Crystal Moynan, 2014 Minnesota SJWP winners, sample an invasive benthic fish known as Round Gobies on Lake Superior. Photo courtesy of Welsh. Minnesota requires seventh grade students to design and perform a research project. Welsh’s students and others interested in the environment and water quality, as well as students in science, engineering, and math interests, work with her on their projects. Some continue working with Welsh for independent science research credits as they move into high school, she said. After spending as many as 6 years as a mentor, Welsh forms a close relationship with these students and tries to help them “realize all of the amazing possibilities that reside within,” she said. When students work on topics that interest them, they will work hard, Welsh has found. “I have students who ask me to stay after school, work on weekends, and even research during school breaks. It is unbelievable the passion they have for their own work,” she said. Angela Moynan, two-time Minnesota SJWP winner, mixes serial dilutions of ibuprofen to assess pharmaceutical contamination in the St. Louis River. Photo courtesy of Welsh. Welsh first learned about the competition in 2001 when her daughter, Elizabeth James, was selected as Minnesota’s SJWP winner. James not only competed at the U.S. SJWP competition in 2002 but also was selected to compete on the national level in 2003 and 2004. As her teacher, Welsh attended the competitions with her daughter. “It has always been one of my favorite events to attend,” she said. 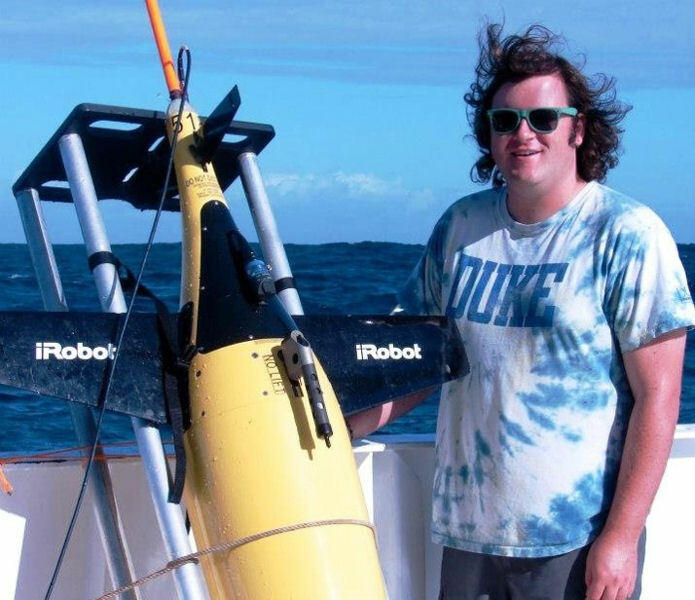 Logan Pallin, currently is studying humpback whales in Antarctica as a Oregon State University (Corvallis) graduate student, monitored ocean water quality off the North Carolina coast as an undergraduate student at Duke University (Durham, N.C.). Photo courtesy of Welsh. Welsh has witnessed her students’ achievements and seen how work on research projects influences students’ majors in college and career choices, she said. These include scholarships to Yale (New Haven, Conn.), Stanford (Calif.), Duke (Durham, N.C.), and Pennsylvania State University (State College). SJWP alumni compete and win awards at national and international science competitions, win research grants and awards, pursue water science-related degrees, participate in study-abroad programs, complete and publish original research, and mentor other young scientists, Welsh said. “One student was asked to present at the first ever White House Science Fair in Washington, D.C., and five have published their work in professional journals,” she said. James has earned a master’s degree in water natural resources from the University of Minnesota, Duluth, and published her graduate research in the Limnology and Oceanography: Methods journal. 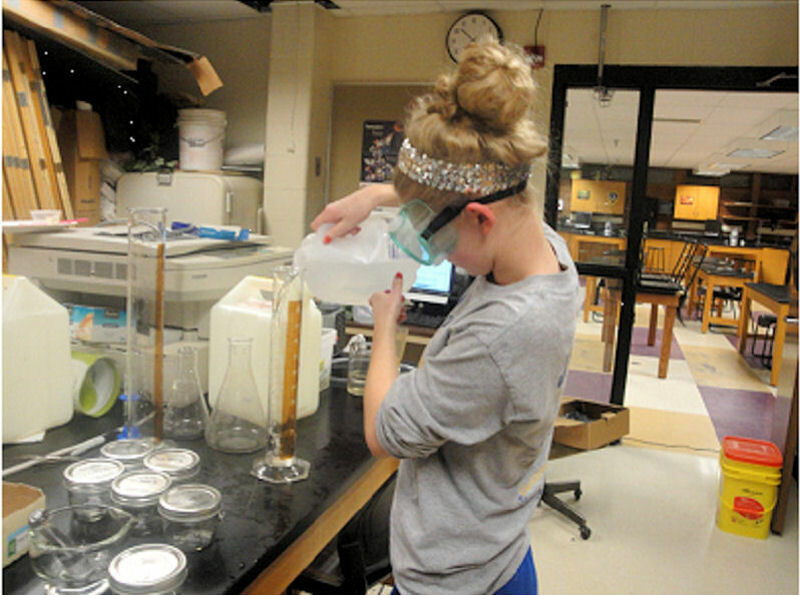 She has spent 2 years working in a mobile laboratory analyzing contaminated sediment working with two other past SJWP competitors, and she has published research in the Zebrafish journal. Logan Pallin was a three-time participant and placement-medal recipient at The International Sustainable World Energy, Engineering, and Environment Project (I-SWEEEP®) event and four-time participant and multiple top-grand award recipient at the National American Indian Science and Engineering Society (Albuquerque, N.M.) fair. He also presented at the Intel (Santa Clara, Calif.) International Science and Engineering Fair three times and received a special award from the North American Benthological Society, now known as the Society for Freshwater Science (Chicago). He also earned a full scholarship to Duke University and graduated with a bachelor’s of science in marine biology. He is studying whale genetics at Oregon State University (Corvallis) and recently set sail to Antarctica on a research expedition to study climate change’s effect on humpback whales. Bethany Rosemore attended the Intel International Science and Engineering Fair three times and won a fourth place grand award. She is majoring in environmental science at the University of Rochester (N.Y.). She spent the 2015 winter semester studying marine life on the Galapagos Islands. Her 2010 research paper is published in the Zebrafish journal. Angela Moynan is majoring in environmental science at the University of Minnesota, Duluth, and has been selected as a McKnight Scholar. She works for the Lake Superior Sea Grant research program, and her research has been published in the Zebrafish journal. She also has traveled with Welsh’s students to a science fair as a research mentor. Cassandra Roy is majoring in biology at the University of Minnesota, Duluth, and works in a laboratory at the university assisting with research on the effect of mining on wild rice. She was selected as the 2015 Department of Education American Indian College Student of the Year. Since the Stockholm Junior Water Prize (SJWP) began in 1997, student competitors have gone on to have impressive careers and make notable contributions to research and the water sector. The Water Environment Federation (WEF; Alexandria, Va.) Highlights will feature some of the most notable of these achievements in an ongoing series found by the keyword SJWPShowcase. Can’t wait? Find more information about SJWP alumni on WEF’s Where are they now webpage.